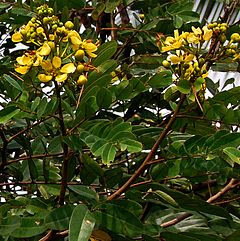 Medical plant Johar or(Cassia siamea Lamk,) is Annual herbaceous plants, spread. Stem round, creeping, jointed, hollow, bare, forked, about 3 feet long, green color. Single leaf green, alternate, lanceolate shape, sharp edges, flat edge, rompang base, 3-15 cm, 1-9 cm wide, pinnate bone,. Single flower, trumpet shape, in the armpit leaves, 3-5 cm, a diameter of about 5 cm, the color purple. Fruit box, oval, bald, about 1 cm in diameter, this medical plant have pale green young fruit after dark brown. Efficacy Antipyretics. RESEARCH in 1991. Faculty of Pharmacy, Gadjah Mada University. . Has conducted research hypoglycemic effect of water decoction of leaves Johar, on white male rats, compared with tolbutamid. From these findings, the water turned out to ta Johar leaf decoction dose of 2.5, 5.0, and 10.0 g / kg bb can reduce LDDK (The area under the curve) blood glucose level of negative control, the group of normal mice given a glucose load (DMTTI - UTGO = no insulin-dependent diabetes mellitus. oral glucose tolerance test). In the group of normal mice are not given a glucose load (DMTTI), leaves boiled water Johar dose 10.0 g / kg bb can reduce blood glucose levels LDDK of 15:06% against a negative control. , 1993. Department of Pharmacy, FMIPA UI. Has conducted research hepatoprotective effect of leaf infusion Johar on white rats given carbon tetrachloride. From the results of these studies, it turns out leaf infusion Johar has a hepatoprotective effect. Johar medical plant leaves contain compounds that can inhibit an increase in GPT activity, plasma and liver tissue destruction caused by CC14 and there is a relationship between dose and effect. Aan Risma Uli N., 1994. Department pharmacy,, FMIPA UI. Has done research of antimicrobial influence of leaf infusion Johar against some bacteria and fungi causing skin diseases. From the results of these studies, it turns out leaf infusion,medical plant Johar has an antibacterial effect against Staphylococcus aureus, Pseudomonas aeruginosa, and Proteus.vulgaris, but does not show antifungal activity against Candida albicans, Trichophyton mentagrophytes and Microsporum canis.